The M4x.44xx-x4 series digitizers deliver the highest performance in both speed and resolution. The series includes PCIe cards with either two or four synchronous channels where each channel has its own dedicated ADC. The ADC’s can sample at rates from 130 MS/s up to 500 MS/s and are available with either 14 bit or 16 bit resolution. The combination of high sampling rate and resolution makes these digitizers the top-of-the-range for applications that require high quality signal acquisition. The PXIe digitizers feature a interface with PCI Express x4 Gen 2 interface that offers outstanding data streaming performance. The interface and Spectrum’s optimized drivers enable data transfer rates in excess of 1.7 GB/s so that signals can be acquired, stored and analyzed at the fastest speeds. 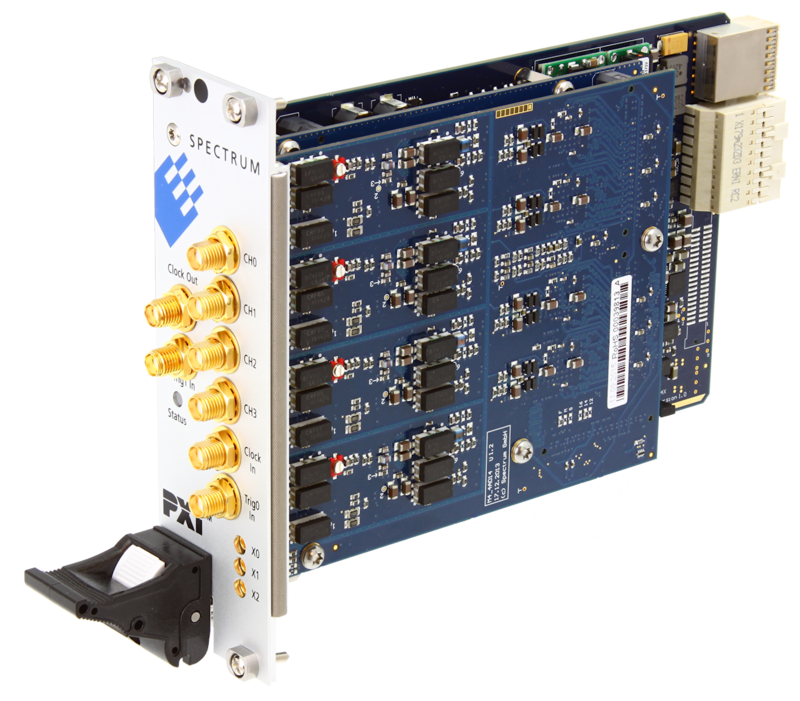 While the cards have been designed using the latest technology they are still software compatible with the drivers from earlier Spectrum digitizers. So, existing customers can use the same software they developed for a 10 year old 200 kS/s multi-channel card and for an M4x series 500 MS/s high resolution digitizer! 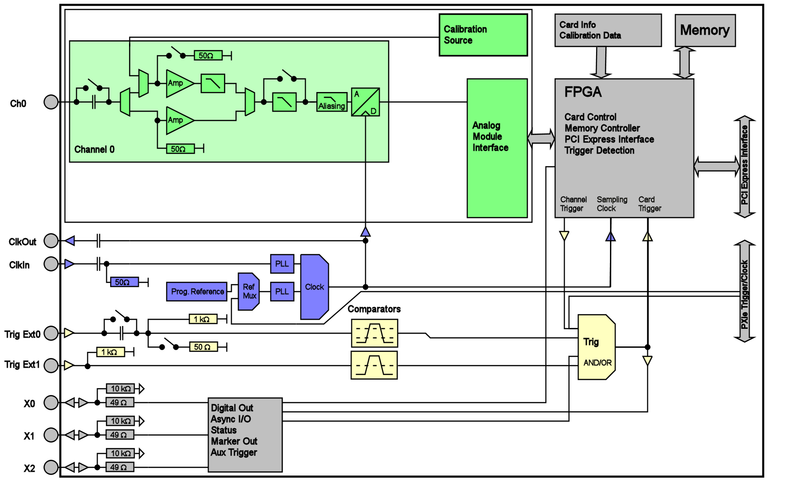 The FIFO mode is designed for continuous data transfer between measurement board and PC memory or hard disk. The read (acquisition) transfer rate reached depends on the motherboard and can be up to 1.7 GByte/s on a PXI Express x4 Gen2 slot. The control of the data stream is done automatically by the driver on interrupt request. The complete installed on-board memory is used for buffer data, making the continuous streaming extremely reliable. The card has four SMA connections for the analog channels, additional four SMA connections for trigger input/output and clock input/output and three MMCX connections for auxiliary signals like second trigger or Multi Purpose lines.